pcmhacking.net - View topic - Bowser Electronics GM OBD2 Cable ? Bowser Electronics GM OBD2 Cable ? I got one of these in a lot of other items and have none of the software that used to come with these. Does anyone have a clue what the specs on them are or what it could be useful for? I'm guessing it supports VPW since they used to support GM enhanced data before a lot of other companies did. It doesn't seem to support ELM327 from when I tested it real quick. 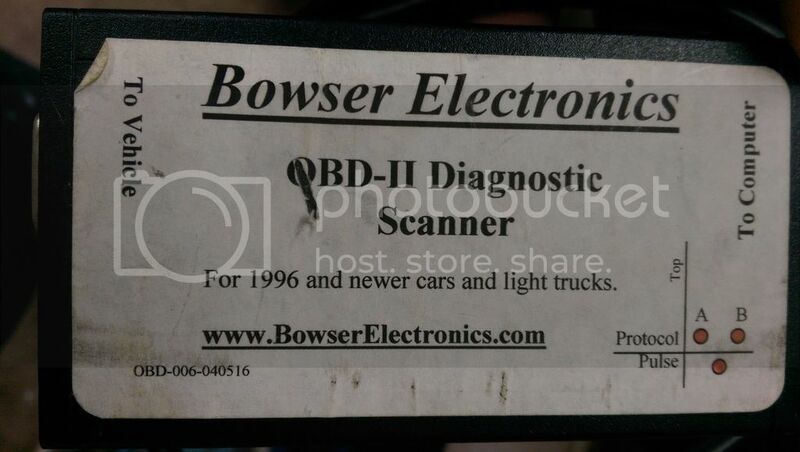 Re: Bowser Electronics GM OBD2 Cable ? Can you open it up get a high res pic of the circuit? I thought you may ask that! a little pic micro? 16f628a with max232 and voltage comparator setup, not sure what the chip is under the hot snot prob a led driver? Looks like an old OBD2 code reader. I would think any of the free software like scantool.net early version would likely work. Heres the user manual, and the last update that was made available. Unfortunately the full install was 404 so I couldnt grab it. You may be able to get the update working with some hackery. So it looks like mine is the older Non-Can model based on the serial #. I'll see if I can work through the pre-req's one-by one and get the .exe to run. I know this is a really old thread, but, I got one of those off of ebay years ago. Yes, they went out of business about 5 or more years ago. I remember the web site and from what I remember it was almost like a "mom and pop" type site, I use to check their site every month or 2 months for new versions of software or eprom updates. I actually sent them $5 for an upgraded eprom just before they went out of business and popped it in (may still have the old eprom somewhere...) it supported the newer communications on some of the newer ecus at the time I do however have the original software saved on my hard drive iv transferred from computer to computer over the years. I figured i could upload it and help a few people out if they search for it. You will need a serial to usb Prolific type cable and driver for that cable to get it working. I could not find a driver for windows 10 or 8 for the cable I have last time i checked, I use Windows XP with no issues. You can scan codes, do dyno test, reset codes and look at the monitor status of different system monitors of the ecu, do a 1 second interval refresh rate and look at live time readings on all of the sensors and alot more stuff i may be forgetting. You will not find this software anywhere else, trust me. I actually found mine today and attached pictures of it. It’s different than the one you got on the inside.